Imagine a tropical paradise filled with fun and adventure. You’re climbing up the side of a waterfall with the mist spraying in your face. Now imagine a vast desert that seems to stretch as far as the eye can see. What if you could travel Earth in a day? Today, in the year 2537, Città Sotto Ghiaccio, located under the oceans of Europa, one of Jupiter’s moons, provides its citizens a healthy lifestyle in a thriving economy. No that's not the new series on the Sci-Fi Channel, but the program behind the entry that made the team from Hubble Middle School in Wheaton , pictured here, regional winners in the 2007 National Engineers Week Future City Competition, which asks 7th and 8th graders to design their visions of the city of the future, first on computer, then in a large three-dimensional model. Last year, more than 30,000 students from 1,000 schools in 34 regions competed. This year, studies will begin in October, leading up to regional finals next January at UIC, where first place winner will get a trip to the national competition in Washington, D.C. help during National Engineers Week, February 17-23. Prizes for the final winning team include a trip to U.S. Space Camp in Huntsville, which is only appropriate, since 1996 winner Anna Gunn-Golkin has gone on to a career as a launch systems engineer at Vandenberg Air Force Base. Currently, Chicago regional co-ordinator Don Wittmer is looking for local schools to participate and engineers willing to volunteer. He can be contacted at 312/930.9119 or via email. Registration deadline is October 15th. Additional information, including the Future City brochure, can be found at the competition's website. "One of the most colorful social rituals of the time was the Sunday promenade down Grand Boulevard in the summer, where thousands of expensive carriages majestically bore the wealthy to the race track south of Washington Park." Despite some rough times in decades past, most of the mansions and greystones of King Drive survive today, and gentrification is seeing more and more of the old grand dames restored for today's economic elite, with new construction, attempting to blend in with varying degrees of success, taking over many of the longstanding gaps of vacant lots. The "contemporary" concrete block and brick mansion to the left in this photo can be yours for 740K, while the thoroughly renovated Queen Anne original to the right, 4000 square feet, six bedrooms, three-and-a-half baths, can be yours for $699,900, which in downtown Chicago would be lucky to get you a cramped three bedroom in one of those new "luxury" condo towers where a fancy name seeks to mask a basic poverty of design. 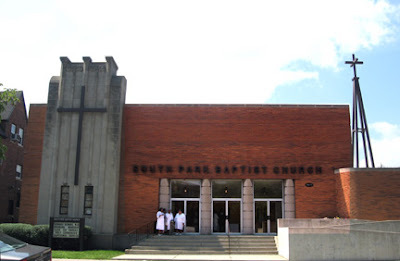 Modernism isn't King Drive's thing, but there are scattered notable exceptions, such as 1953's Art Moderne South Park Baptist Church . . . 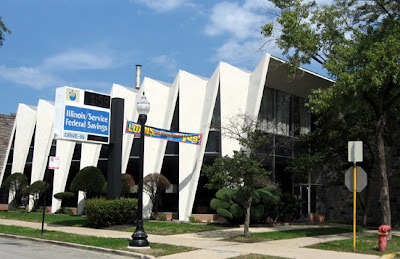 Pride of modernist place, however, has to go to the Illinois/Service Federal Savings headquarters, just north of 47th, home to one of the last black-owned financial institutions in Illinois. It's a bright, high-contrast accordion of white concrete and dark triangular windows, bookended between tall, Prairie-style stone walls. 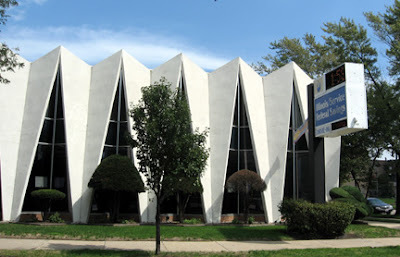 Lee Bey calls it, "One of a few examples of Googie/populuxe/midcentury modernism on the city's South Side." 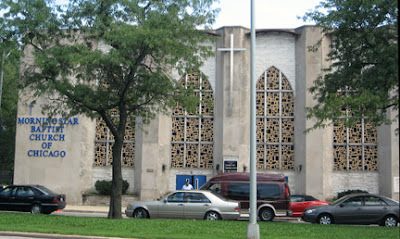 Dating from 1962, it's a lovely counterpoint to all the heavy masonry that surrounds it. 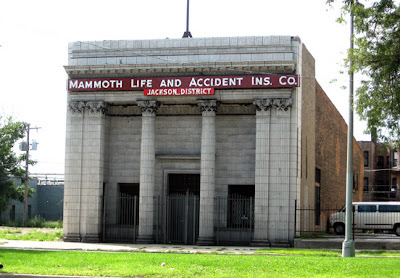 Just across the street, you'll find the Mammoth Life and Accident Insurance Company, Jackson District, building standing alone in abandoned splendor, moated by surface parking and a vacant lot. My bet it was originally a bank, probably failing in the Great Depression. Its compact, bulldog form is like a Temple of Dendur, gussied up in Corinthian attire. Today, small, thin reeds of broken neon hang from the letters of the large crimson sign, as the building sits silent as tomb, wondering whether what it's awaiting will turn out to be a prince or a bulldozer. Who would perpetrate such a thing? We unmask the mystery culprit - and reveal his picture - here. 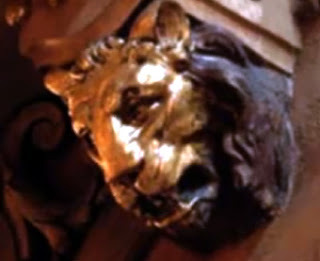 A note from David Balaban alerted us to a couple of new videos on the Balaban & Katz Foundation website, dedicated to the legendary family company that dominated Chicago film exhibition in the era of the movie palace. The first contains excerpts from a documentary Balaban is making of interviews of family members remembering the four brothers who built the chain. He's also the author of the recent book, The Chicago Movie Palaces of Balaban and Katz, which is both a chronicle of Balaban's family, and a museum of factoids, stories and photos from the heyday of the ornate theaters, including a summary of receipts that shows that the flagship Chicago, alone, entertained an incredible 2,200,000 patrons over the just the first half of 1924, with an average weekly gross, adjusted to today's ticket prices, of nearly $750,000. 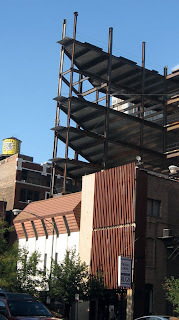 The second new item points to a YouTube video, The Uptown Today, edited by Balaban, which features a series of images by Loren Robare of the architectural details of 5,000 seat North side movie palace, closed since 1981. 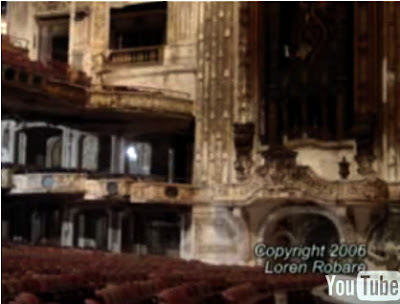 The theater continues to decay, with the auditorium in the video looking like the bleached bones of a lost castle sunk to the bottom of the ocean. 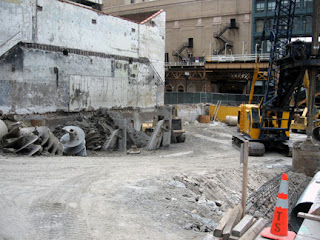 In May, Crain's Chicago Business reported that, after decades of attracting nothing but dust, two different suitors were fighting to acquire and restore the Uptown, but since then an ominous silence has again descended. Earlier this month, another of Chicago's famed palaces was lost when the 2,000 seat, 1931 Nortown was demolished, after being closed since 1990. 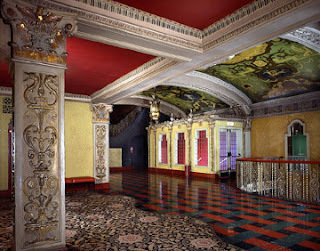 The beautiful shot you see here, for sale as a print for $800, is sampled from the web portfolio of the work of photographer Russell Phillips, a remarkable series of color shots of Chicago area movie palaces from the 1980's, many of which - the Nortown, the Esquire, the Parkway - are now gone. Even though the structures were already in deep decline and nearing their end, Phillips was able to capture their original astonishing beauty one last time. Check out this remarkable shot of the Moorish-styled ceiling of the United Artists, demolished in 1989 in exchange for what would remain a vacant lot for the next 15 years, until construction finally began on Block 37. Psssst, hey - buddy! 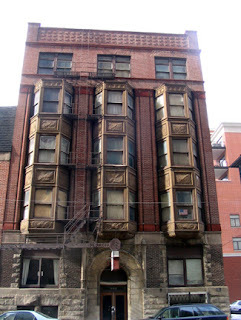 Wanna buy the Larkin Building? You may have heard Frank Lloyd Wright's Unity Temple referred to as a jewel box of a church, but now you actually have the opportunity to stash your own baubles there. 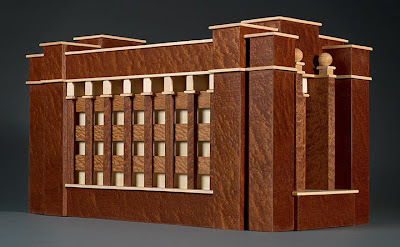 Not in the real thing, of course, although I'm sure the Unity Temple Restoration Foundation will accept any spare gemstones you may care to donate. 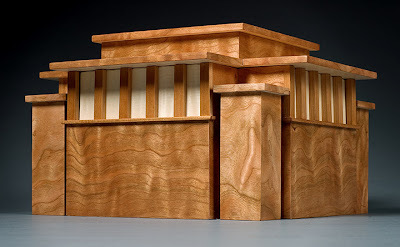 In addition to the three compartment Unity Temple box, there's also a six compartment box replica of the demolished Larkin Bulding, until 1950 in Buffalo, New York, and now in Pommele Sapele, Lacewood, and Curly Maple. Open the box by lifting off the roof, and you can almost hear the soft click track of all the teensy-tiny clerks pecking away at their teensy-tinier typewriters. 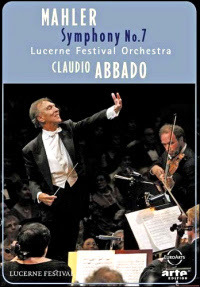 Can Claudio Abbado really be 74? The fondly remembered former principal guest conductor of the Chicago Symphony paces himself carefully these days, six years after treatment for cancer ended with the removal of much of his stomach. 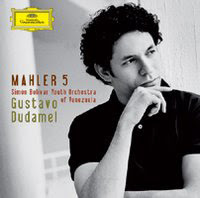 As noted in an excellent profile by the New York Times' Daniel J. Wakin, the boyish-looking conductor, now gray and frail, has turned away from the power centers of classical music - La Scala, the Vienna Statsoper and Berlin Philharmonic, which he led from 1989 to 2002 - to lead both the Mahler Youth Orchestra, and the Lucerne Festival Orchestra, which he founded in 2003, and which he will take to Carnegie Hall in October. As anyone who's listened to his recent recordings can attest, he's reached the golden autumn of his career, when the respect and rapt attention of his players overcomes declining physical prowess. Every time he steps to the podium, he personifies the immensity of the human creative spirit, and its ultimate fragility. As Mark Twain once noted, it's the kind of thing that tends to concentrate the mind, and the result is often deeply profound performances whose power and emotion carries the best of what we are into the sinews of new generations. Abbado's tribulations has left his ambition - and courage - undiminished. He's looking forward to conducting Fidelio for the first time next year (11 performances! ), and his Carnegie Hall concerts will include not only a pair of Beethoven 9th's, but the Mahler Third, which he conducts at the London Proms tomorrow (Wednesday) night. (You can listen to the concert on-line off the BBC Proms website, both live - my calculation is 1:30 P.M. Chicago time - and as a rebroadcast, for one week only.) The New York Times story also includes links to several snippets of Abbado rehearsing the work. Gustavo Dudamel (conducting without a score) violently contrasted the two [aspects of Shostakovich's Tenth], concentrating on hushed textures and interplay of lines in the former and ejaculating the brisker passages with horrifying, agitated urgency. Dudamel's Proms triumph was powered not by the members of a Berlin Phil, or VPO, but by his own Simon Bolivar Youth Orchestra, a 200 person ensemble drawn from Venuezuela's extraordinary El Sistema, a nationwide music program that includes a quarter million children. In capability and inclusiveness, nothing in American music education comes close. The virtuosity of the young players in the Simon Bolivar was more than a match for that of the blue blooded orchestras with which they shared the Proms, pumping the excitement of critics and audiences alike. "The performance of the season . . . ," gushed The Independent.
" . . . a superstar conductor who on this showing could hardly be priced too high," The Independent wrote of Dudamel, "He is musical in every fibre of his body." Like the young Leonard Bernstein, who made his own incendiary entrance over half a century ago, Dudamel is flying very close to the sun. (Fittingly, Dudamel's Proms concert included an impassioned performance of the Symphonic Dances from West Side Story.) Dudamel's giving off a brilliant light, and he will pay a price. Savor these all too infrequent moments of unalloyed joy. A fiery young cub, a lion in winter. To everything there is a season. 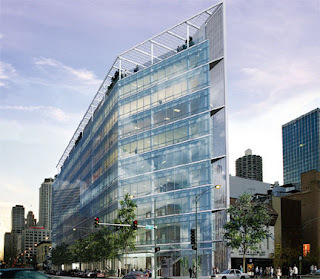 A rendering was released last week of still another new Chicago hotel, this one in River North at State and Erie. The dana hotel and spa (having committed $60 million to the project, Neighborhood Development Corporation and Gold Coast Hotels, Inc. apparently didn't have any money left over for capital letters in the name) is being constructed on the site of an another Hotel Dana - opened in 1891 as the Erie Hotel, which was demolished, despite the efforts of local preservationists, to make way for the new, much larger structure. 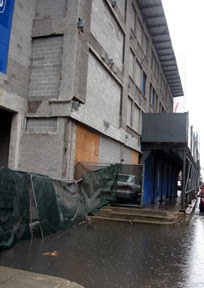 An extensive press release says the developers "initially considered the former Dana Hotel . . . as a historical renovation project, a specialty of Neighborhood Development Corporation," but - surprise, surprise - "Ultimately, it was deemed structurally and economically unfeasible for preservation." Emphasis on economics. Hotel Dana was five and a half stories. dana hotel will be 26 stories and have 216 rooms, "competitively priced" beginning at $350 a night, which probably would have bought an entire week or more lodgings at the old place. The new dana is the work of the Chicago firm of Eckenhoff Saunders Architects, who are also architects of the new Southgate Market along the booming new Roosevelt Road retail strip, as well as the ill-fated Museum of Broadcast Communications, further down on State, which has remained unfinished for over a year after funding for the project ran out last spring. Architect Walter Eckerhoff is quoted as calling the new dana "an exercise in simplicity." It's a simplicity in the Miesian carriage trade style, with an aluminum and glass facade, and a ground floor offering "an undulating timber wall" and "two-story fireplace." The design of the spa will include bamboo bricks and recycled glass terrazzo flooring. Guest rooms will match exposed concrete ceilings to walnut wood floors. Registration and lobby will be located on the second floor to allow , in the words of the press release, "the ground floor to give back to the neighborhood and serve a more public function." 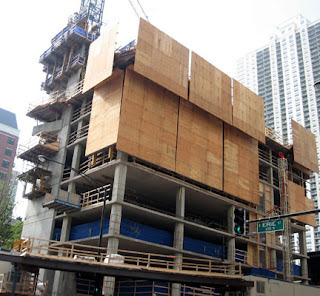 The sleek design looks to be a positive addition to River North, but currently it's probably most noted for the vast expanses of plywood being deployed in its construction. The 1891 Dana, while not quite so posh, was pretty neat for its day. 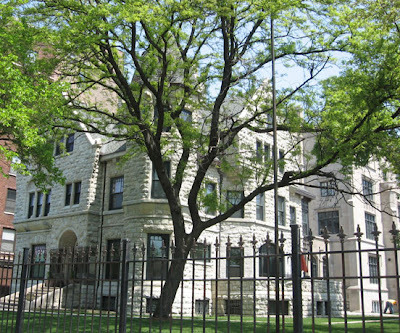 According to a first-rate history on the Preservation Chicago website, it was designed by Normand S. Patton and Reynolds Fisher, who also designed the original Armour Institute building on the IIT campus, and the Chicago Academy of Sciences, now converted to a park district admin building, at Clark and Armitage. Opened as the Erie Hotel, the Dana combined Queen Anne stylings with Romanesque details, with three projecting metal and decorative pressed brick bays centering the composition. The press release announcing the new hotel tells us 'dana' means "the pleasure of giving" in Sanskrit, a factoid of which the architects of 1891's Hotel Erie, as well as the proprietors who renamed it the Dana, most probably went to their graves blissfully ignorant. Still, you'd likely be getting a lot of pleasure, too, if every room night booked got you $350.00 and up a pop. The Grant Park Advisory Council will present plans for a new building for DuSable Harbor tonight, Monday, August 20th, beginning at 6:30 P.M. at the Daley Bicentennial Plaza at 337 East Randolph, just east of Columbus. The new structure will be built west of DuSable Harbor and north of Randolph, replacing an existing set of trailers. David Woodhouse Architects , designers of the award winning Beach House at Rainbow Park and Beach, and the Chicago Park District will present the plan. For additional information, call Bob O'Neill at 312/829.8015. Supertalling It: Architecture critic Blair Kamin offers up a crackerjack story in this Sunday's Trib on the current rage in engineering skyscrapers, which involves a massive service core connecting to a ring of external columns through a series of "outrigger" walls that increase stability against the wind. All of these components are of reinforced concrete of varyingly large thicknesses. In another sign that the Trib may finally be figuring out what web journalism should be, the on-line version of the story is not only as good as the print one, but better, despite carrying over key graphics, not in html or flash, but in a pdf file. 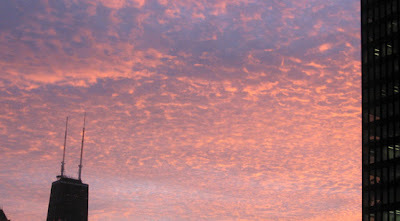 The web version includes a video for each of the 1,000-foot-plus-high skyscrapers Kamin covers. 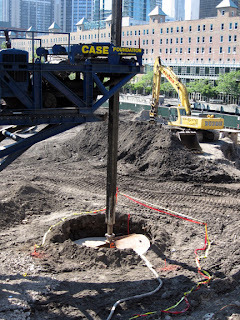 The first is on Santiago Calatrava's Chicago Spire which, as we reported two weeks ago, is now actually under construction, with fourteen caissons, ten feet in diameter and up to 120 feet deep, being drilled into the ground on the site west of Lake Shore Drive between the Chicago River and Ogden Slip. 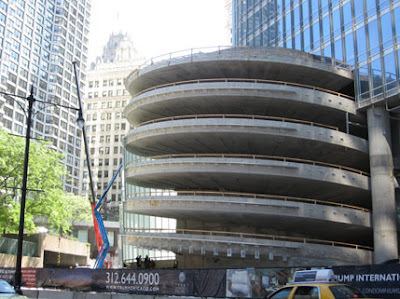 Kamin, a vocal skeptic of the project's prospects, now says the activity "sure looks like it's real," although, even at a cool quarter-million dollars each, the cost of caissons represent little more than a drop in the bucket of the Spire's eventual $2 Billion on up price tag. We're still a long way from any guarantee that it will make it to the finish line. 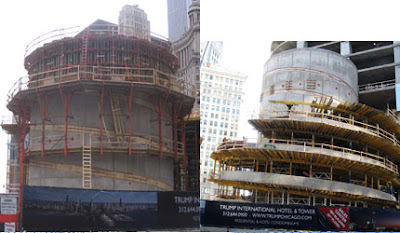 The second video enlists Skidmore's master engineer William Baker as a tour guide of the construction of Trump Tower. At one point he enlists a visibly amused co-worker to demonstrate with their two bodies the basic core/outrigger technique. 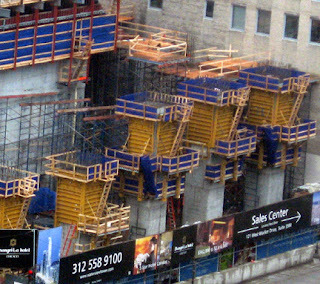 The final video features Teng & Associates' R. Shankar Nair, structural engineer for the new Waterview Tower on Wacker, who reveals that a large part of the southwest quadrant of that structure is empty, slabless space, since the way it windowlessly abuts existing structures apparently offers so little in rental/sales value that it doesn't make economic sense to finish out the floors. It's just there to support the units constructed above it, at the point where actual views kick in. Nair explains the Waterview's own core/outrigger system. Still, especially on the web, this is a marvelous piece, the kind that wins awards - and deserves them. (damn him). You can begin at the starting point here. Ten Modern Masterpieces - when you're dealing with a slick monthly like Chicago Magazine, you can never be too sure that an article with a name like that won't just be the latest variation on last month's Ten Best Body Wax Salons, but when the writer is the always reliable Jay Pridmore, the result can be depended on to exceed expectations. Like Kamin's, Pridmore's piece is light on analysis, and heavy on boosterism. That's what sells newspapers, and magazines. 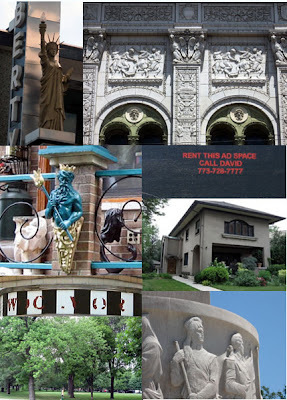 You have to keep in mind that even ten masterpieces can't make up for a pervasive cheapening of Chicago's architectural fabric. But drowning, as we are, in a contagion of dreck, its good to have Pridmore remind us that we're still capable of great things. Pridmore's most controversial stand may be calling John Vinci's Arts Club "a brilliant updating of mid 20th-century modernism." I'm not sure even Vinci would go that far in defending his graceful building from its critics. Most of Pridmore's top ten are fairly safe choices: Ronan's Comer Center, Jahn's State Street Village, Gehry's Pritzker bandshell, Ralph Johnson's Contemporaine, Krueck and Sexton's Spertus Institute (which won't be finished until November), Lohan Caprile Goettsch's UBS Tower, and Jean Paul Viguier's Sofitel Chicago Water Tower, for my money the best Chicago building over the last decade. Filling out the list are less obvious picks: Dan Wheeler's Pritzker House, Booth Hansen's Republic Window and Door on Goose Island, and Stuart Cohen's shingle house in Glencoe. The Magazine also polled AIA Chicago for its picks, and got 140 replies that, when totaled, included only four of Pridmore's. The architects' alternative choices run from the obvious (Goettsch's 111 S. Wacker - an even better building than UBS - and Rafael Vinoly's U of C School of Business, with its wonderful atrium that marries the lightness of a Chicago train shed with Frank Lloyd Wright's mushroom columns), to the credible (Johnson's Skybridge and Notebaert Nature Museum, Henry Cobb's Hyatt Center), to the inexplicable (Kleihues' Darth Vader mausoleum for the MCA). This is another case where the article, and its sidebars, are all adeptly presented on the Chicago magazine website. Check it out here. The current New Yorker magazine has a must-read article by David Owen on how our obsession with abolishing night through an evermore blazing slather of artificial lighting is disconnecting us from the cosmos by rendering it invisible. Four centuries ago, Galileo, with a telescope so primitive that today it would be considered a children's toy, was able to see the the moons of Jupiter as well as the mountains of the moon. In our own time, "light pollution" has made this impossible in all but a dwindling number of remote locations such as the outback of Australia or the mountains of Peru. Owen notes that even standing on the North Rim of the Grand Canyon on a dark night, the brightest thing is the sky is not the Milky Way, but "the glow of Las Vegas, a hundred and seventy-five miles away." The sight of a sky flooded with stars blinking on and off is something most of us now experience only through a CGI cliche. Owen chronicles the ongoing efforts of the International Dark Sky Association to return us to a darker world, which sounds like flake city until you realize how much of the energy we expend on night lighting is hugely wasteful and, at times, counterproductive, even destructive. He talks of "glare bombs", lighting fixtures that cast much of their light sideways, into the eyes of pedestrians, creating glare that actually decreases visibility, or upward, uselessly up into the sky. New codes, like those in Tucson, mandate outdoor lighting that is of a "full cutoff" or "fully shielded" type, casting "no light above the horizontal plane and employ a light source that cannot be seen by someone standing to the side." Moving to that kind of lighting has recently saved the city of Calgary, Canada, roughly two million dollars a year. Nighttime visibility is about contrast, and the blight of light actually undermines our vision's natural capacity to acclimate to - and perceive objects in - darkness. Human night vision is acute, but the rods in our eyes that make it possible can take a hour to adjust after exposure to something no brighter than a desk lamp. Owen relates how indiscriminately bright night lighting actually becomes "criminal-friendly." A burglar whose flashlight is the brightest object is immediately conspicuous; one operating in the massive shadows created by glare bombs is not. There may even be major health implications. Harvard's Nurses' Health Study has speculated that many medical problems - night shift workers having an increased risk for breast cancer, for example - can be traced to the lack of melatonin, "a cancer-protective agent whose production is severely diminished in people exposed to light at night." Excess nighttime lighting can have devastating effects on migratory birds, at times killing thousands in a single night. 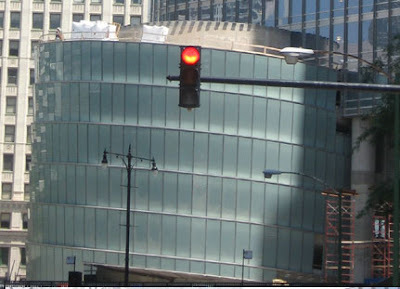 (In Chicago, this has led to getting skyscrapers like the Hancock to turn down their lighting during migratory seasons.) Bright lights have been linked to the decimation of insect populations, and in Florida, of sea turtles. Newborn turtles are drawn to the brightest horizon. "For millions of years," says Owen, that has been "the night sky over the open sea." The cover of darkness protected their journey, but today, the turtles may just as easily be drawn to the open parking lot of a floodlit shopping mall, where they find themselves lit up in a way that advertises a "come-and-get-it" ease to their predators. Think Mrs. Venable's cheery tale in Suddenly, Last Summer. It's a fascinating read, well worth the $4.50 cover price of the print version of The New Yorker, which you'll have to shell out because the article isn't on their website. Burnham, Root and the man "responsible for the modern office building"
While all but a handful of his large commercial projects have been wantonly destroyed, a number of houses and smaller commissions designed by John Wellborn Root during his partnership with Daniel Burnham still survive. We'll be covering them in this and future posts. 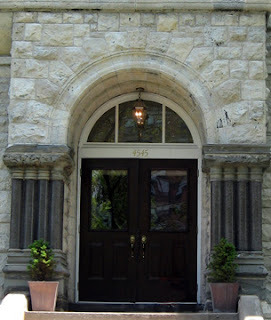 One of the most interesting is the William E. Hale at 4545 South Drexel Boulevard, completed in 1886. It was designed for William E. Hale, who Louis Sullivan lauded in 1916 as one of two men "who are responsible for the modern office building." (The other was developer Owen Aldis.) In 1869, Hale patented the "Hale Water Balance Elevator", replacing the less reliable propulsion by steam with water hydraulics. Contractor Henry Ericsson speculated that a reference to "Passenger Elevator, $5,000" in a memo book of architect John Van Osdel, regarding an 1867 remodeling of the Tremont House, may have been the first known reference to "passenger elevator." 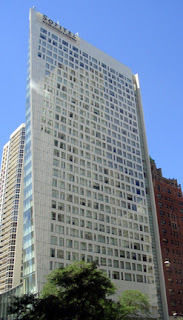 (The Tremont House, then Chicago's premiere hotel, was at the corner of Dearborn and Lake, on a site that's housed two successive multi-story parking garages over the last several decades.) Hale's inventions were manufactured by Otis Elevator, where, as a key manager, he helped transform that enterprise into a powerful corporation. But the house's greatest claim to fame may how it fueled the career of his son, George Ellery Hale, who revealed an early interest - and aptitude - for astronomy. It was at the Drexel Boulevard house that the younger Hale began his experiments, building a 4" refractor telescope on its roof. While still a student at MIT, Hale invented the spectroheliograph, which was able to record solar eruptions not just during rare solar eclipses, but in broad daylight. After graduation, Hale returned to Drexel Boulevard, where his father built Kenwood Observatory for him, complete with a spectroheliograph with a 12 inch lens, right in the house's back yard. Even more remarkable is George Ellery Hale's relationship with Chicago traction magnate Charles T. Yerkes, who made his fortune wallowing through - and mastering - the city's notoriously corrupt politics to create a public transit monopoly. An outcast from the city's business elite with no discernible interest in science, Yerkes was persuaded by Hale to bankroll what would come to named, for reasons I'm sure you'll understand, the Yerkes Observatory, built by the University of Chicago in Williams Bay, Wisconsin, and completed in 1897. The observatory, featured in the 1996 Andrew Davis/Keanu Reeves/Rachel Weisz film Chain Reaction, narrowly eluded the wrecker's ball last year in a deal that included granted developer Mirbeau Company rights to build 72 homes on 45 acres adjoining the observatory. 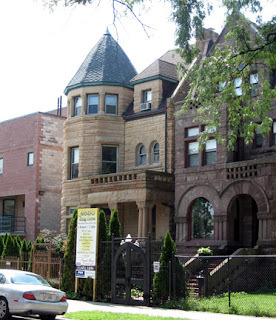 As for the Drexel Boulevard mansion, it looks beautiful on the outside, but it's been carved up into the twenty units of the "Observatory Condominiums and Lofts." The Chicago Architecture Foundation will donate all money from its walking tours leaving from the ArchiCenter Shop, 224 South Michigan, this Sunday, August 19, 2007, to the family of Rachel McKee, whose husband Steve O’Rourke, a popular CAF docent, lost his life in a hit and run accident on July 18th, leaving behind wife Rachel and three young children, ages 9, 4 and 1. Walking tour tickets will be the regular price of $15.00 for adults, $12.00 for students and seniors. A special slideshow companion to Erik Larson’s best-selling novel, Devil in the White City will be shown and narrated by CAF docents, with a minimum entry charge of $20.00 CAF will also be collecting individual donations at the event, and through on-line contributions. Reservations are suggested - for CAF members through Member Services at 312/922.3432 x230, and for non-members at ticketmaster on-line or at 312/902.1500. See information on the full schedule of tours here. 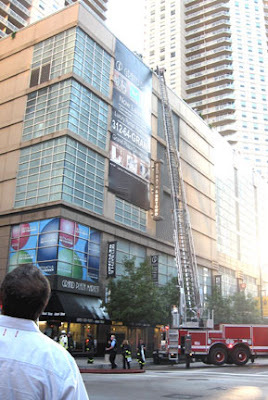 A fire in one of Chicago's tallest residential towers made scarcely a blip in the city's newspapers and broadcasts Saturday (despite a station helicopter hovering above), but it drew Saturday evening crowds along a bustling stretch of State Street in River North. 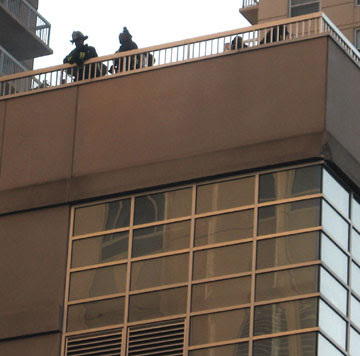 Reports said the fire, in the Grand Plaza complex, just across the street from the historic Tree Studios, began in a restaurant garbage chute, and then triggered an ammonia leak that led to evacuation of a Jewel grocery store at the base of the tower. 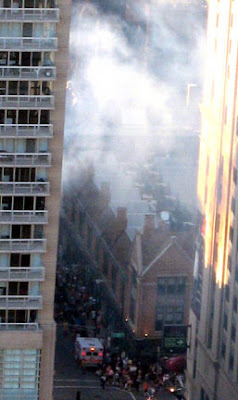 The smoke spewed black, turned quickly to white, and then ebbed and dissipated across the Loop skyline as the spectators below returned to their social engagements. There were no reported injuries. 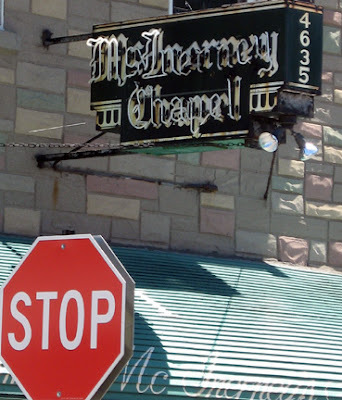 An Urban Legend Revisited - earlier this week, the Chicago Inter Ocean ran a disturbing story about a young Chicagoan who picked up an attractive brunette at a hotel bar, got very drunk, and wound up taking her to a room upstairs for the night. The next morning, he awoke, naked and groggy, in the room's bathtub, soaking in freezing water infused with his own blood, his head, save for openings for his eyes and mouth, packed tightly in ice. His cell phone had been placed on the ledge of the tub, and on the mirror, a note was taped, written in lipstick, that read, in large letters, "Call 911!" Trembling with cold and with dread, he placed the call and related what he knew of his predicament to the operator. She asked him to very slowly reach up to feel his face, and when he did, he found two tubes, one attached just below each cheekbone. The operator fell silent, and then told him to remain very still. She said that she was sending help, but refused to answer the man's increasingly desperate questions. Soon the paramedics arrived. One of them, a young woman with sad eyes who spoke in a Danish accent, leaned down beside the tub and whispered, seemingly at the point of tears, into the man's ear: "Listen carefully. 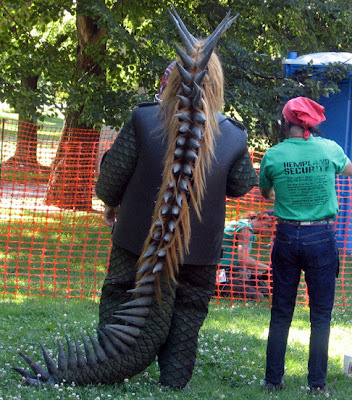 You've been drugged, and they've taken your adenoids." As the man was being placed on a stretcher for transport to the emergency room, a Chicago police investigator who had arrived on scene told him that not only was the woman he had picked up a known psychopath; she was notorious for being an extremely poor judge of the current black market value of various body parts. Today, of course, developers assemble neat, contiguous rectangles for their sites. And if the current owners resist their blandishments, the city will most likely be more than happy to invoke its expanding powers of eminent domain to muscle them out. Today, the premium is on relentless efficiency, and the often numbing regularity upon which it feeds. 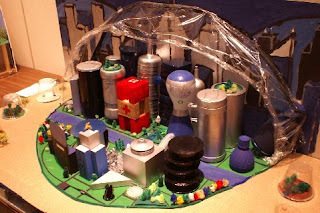 Which makes for cityscapes that are much more ordered, and a lot less interesting. All this was brought to mind by an encounter with a new development from the Alter Group, 111 West Illinois, a ten-story office co-op that will be the new home of the Erickson Institute, which will leave behind its handsome brick loft building on Wabash, just north of the IBM Building and garage. For whatever reason - and I'd to imagine there's a good story behind it - two small, mundane commercial buildings on LaSalle somehow survive, even though they pinch 111 West Illinois to little more than a third of its Clark street frontage. The irregular site has inspired an elegant solution from Solomon, Cordwell, Buenz's Martin Wolf, who recently won high praise from the Trib's Blair Kamin for his 340 on the Park highrise residential tower, part of the Lake Shore East development. 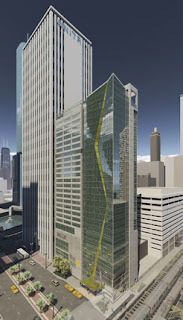 As you can see from the rendering, he takes advantage of the finger jutting out from the main bulk of the building to give 111 West Illinois a triangular taper that reduces to a razor sharp exo-edge where it meets LaSalle. 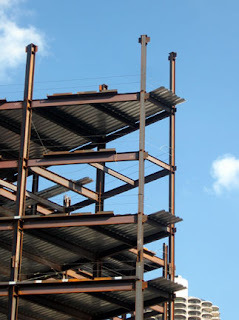 The rise of the structure's steel skeleton has left behind some striking, almost Golgotha like images of spiking columns reaching skyward in the midst of giant cranes. Systematizing a Sustainable Natural Food Ecosystem - develop a long-range plan for a sustainable, natural food cycle with the partnering Notebaert Nature Museum. 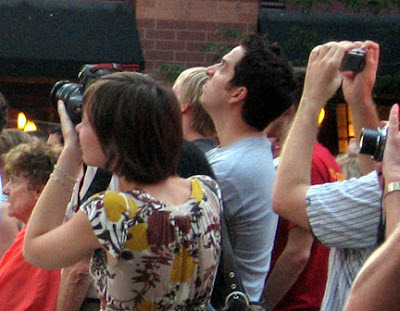 Bid for the 2016 Olympics - work with local government and neighborhood groups to ensure planning and development for the Summer Olympics in 2016 connects to the broader community landscape. Design of Products for Stroke Survivors - partner with the Rehabilitation Institute of Chicago (RIC) to explore design applications for improving work and home life of stroke survivors, with a specific focus on aphasia. Any architect who has the good sense to set up shop in John Wellborn Root's extraordinary Monadnock Building is off to a good start. The rendering of Koo's design for the Wit shows a rather mundane, servicey looking element to the north, abutting the Unitrin Building, and a thin spine, with a square notch at the top, on Lake Street to the east. 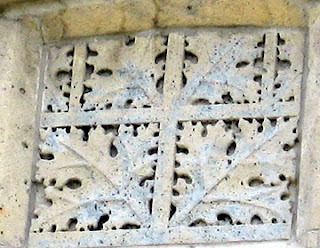 (On one early depiction, these were colored black, but now appear a neutral concrete.) 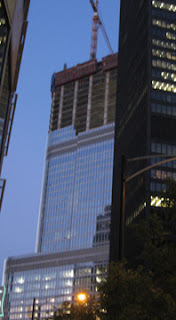 Between them is a shimmering glass curtain wall block spreading out from the corner, with a gold or yellow trimmed cutaway that incises a shallow triangular setback in the building's upper half. 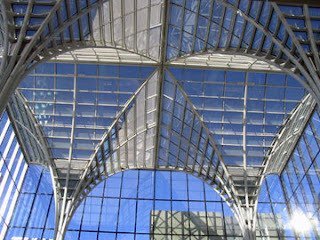 The trim doubles back on a diagonal that stretches down to a large central canopy over the State Street entrance. Last year, ECD had talked about having trademarked Fritzel's, the name of the legendary Chicago restaurant that anchored the site for decades, declaring it was "planning to bring the iconic Chicago supper club back to State and Lake." 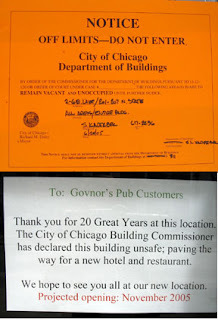 I couldn't find any reference to this on the company's current web site, but I still wouldn't expect the Govnor's Pub/KFC/Taco Bell/Dunkin Donuts combine that occupied the former Fritzel's building until June of '05, when the city helpfully declared the whole thing unfit for habitation, to be coming back to serve the Wit's somewhat more upscale clientele. The Chicago-based Council on Tall Buildings and Urban Habitat has come out against a proposed change to the 2009 International Building Code that would require skyscrapers of a height of 420 feet or more to have three exit stairwells. The proposal, recently approved by the International Code Council, comes out of the National Institute of Standards and Technology's investigation into the 2001 collapse of the World Trade Towers in New York City. 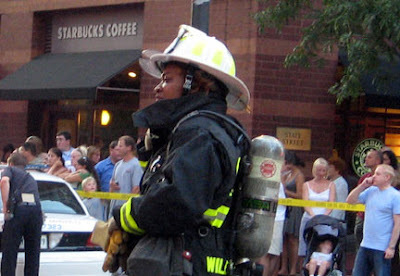 The NIST came up with a list of 30 recommendations, including increasing the bonding strength of fireproofing of structural steel by up to a factor of seven, photoluminescent markings of exit paths, and recommendation 17, which mandates the third stairwell to expedite evacuation while separating occupants fleeing the building from firefighters entering the building to battle the emergency. That recommendation is now part of the proposed 2009 IBC. CTBUH claims the change would not improve safety, but "if applied to many current or proposed schemes, would make them economically unviable and could de-value existing tall building stock." It classifies the proposal as "an outdated method for designing tall or complex buildings. A performance based approach where one tests the design against a set of functional aims using risk based and engineering analyses is the preferred solution internationally and will lead to buildings where the level of safety is demonstrated to be adequate, not assumed to be acceptable." 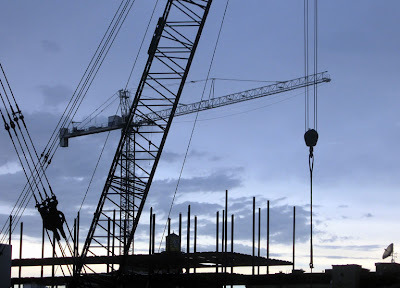 The new IBC would set new safety standards that would likely be incorporated into local building codes of individual municipalities. Thompson Commissary Update - Blame Alschuler!